I'm so sorry for your friend, Kelseecat65. She seems to have a positive outlook and a lot of support. That and the fact that she was physically active should go a long way to helping her recover as well as she can. Wooo-Hoooo!! She is off to Colorado for rehab!!! 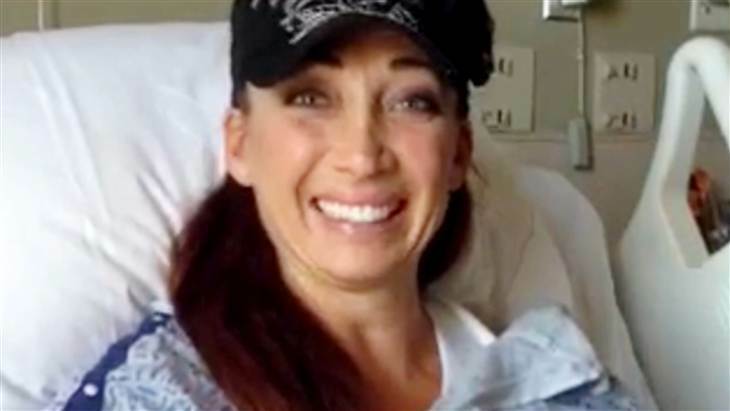 Olympic swimmer Amy Van Dyken-Rouen asked TODAY viewers to keep sending their “positive vibes” in a video Wednesday as she recovers from an all-terrain vehicle accident that severed her spinal cord nearly two weeks ago. Sitting in a hospital bed, wearing a hospital gown and a black baseball cap, the six-time gold medalist gave a wave with her left arm as she greeted TODAY anchors, Matt Lauer and Savannah Guthrie, in the 34-second video. “I just want to thank you guys and everyone who watches the TODAY Show for all of your support, all of your prayers and your positive vibes. It’s definitely helping,” she said cheerfully, tapping her hands together at times. She then spoke about her transfer from a Scottsdale, Arizona, hospital to one that specializes exclusively in the rehabilitation and research of patients with spinal cord injury and traumatic brain injury. “I am now off to Denver, Colorado, to Craig Hospital to begin the next chapter in my life, doing some rehabilitation. So I will keep everyone updated on my Instagram and Twitter as always,” she said. 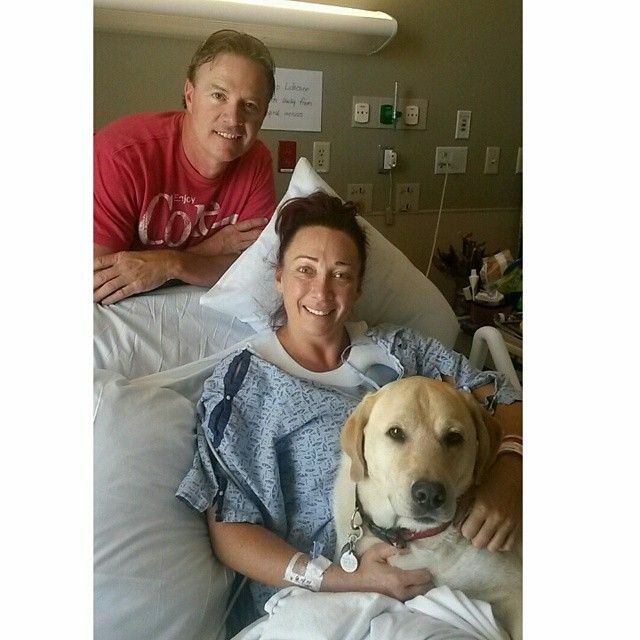 Van Dyken-Rouen, 41, has been active on both social media accounts since her June 6 accident. 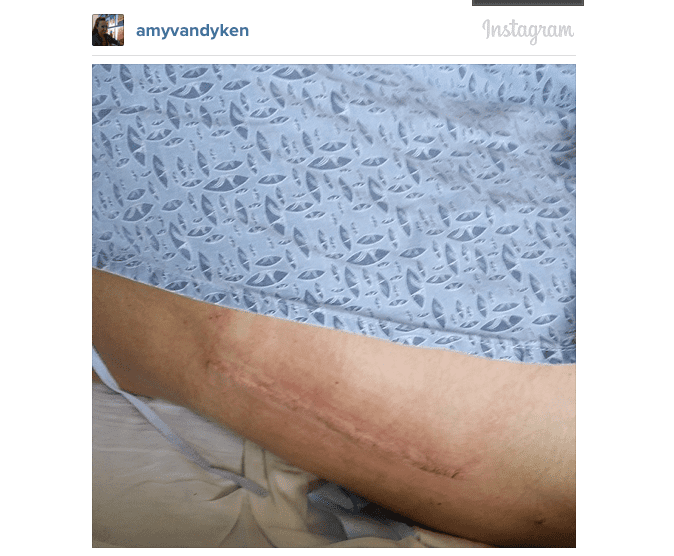 On Tuesday, she even shared a photo of the surgical incision on her back “for those who have been asking,” she noted in the caption. Van Dyken-Rouen ended her TODAY video with another round of thanks. “I will see you later. Wheels up! Bye,” she said, waving her hand with two fingers pointed in a peace sign. 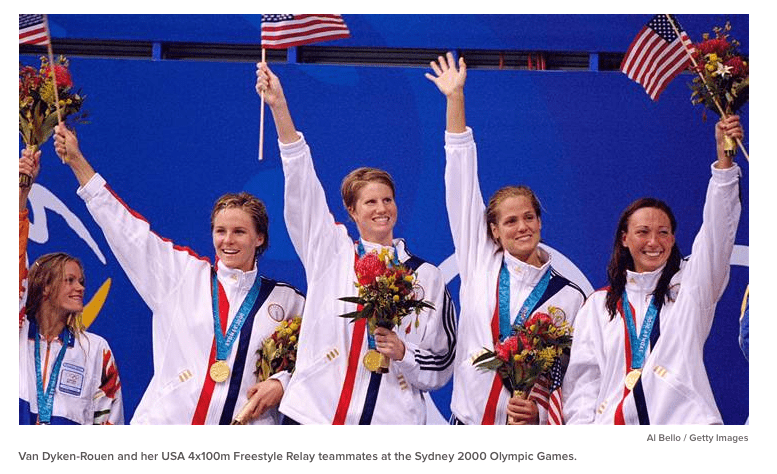 Van Dyken-Rouen, who is married to former Denver Broncos punter Tom Rouen, won four gold medals at the 1996 Summer Olympics in Atlanta. She won another two gold medals at the Sydney games in 2000. Link has video of her arriving at new hospital in CO...GO AMY!! It's times like that I wish you Americans had socialized medicine. The last thing anyone should have to worry about in these situations are overpriced medical bills. That said, I think Amy will be just fine. Differently abled maybe, but fine. My mom's medical bills from her cancer were over the top ridiculous. After her death, my step dad had to file bankruptcy due to having hundreds of thousands of dollars owed that insurance did not cover. The medical costs are out of control. When I had my accident, I spent 4 months in the hospital. I had a few major surgeries. My bill topped out over a million bucks. Thank goodness I was still under my dad's health insurance -blue shield. No big bills or debt. I got SO LUCKY. I was really premature and spent the first 100 days of my life in the NICU. At least I'm Canadian so I still have coverage and my mother isn't bankrupt trying to pay off a 3 or 4 million dollar medical bill. It really is out of control. Hell, my one medication, (my daily injections) alone are over $5,000 a month. I would have to add up the others, but I would be willing to bet all the rest are pretty close to $1500 a month, or more. It's ridiculous. I had Blue Cross for years, it is excellent insurance!